​Attracted to cities where they can nest and roost on ledges and eaves, pigeons can cause damage to buildings and cars with their droppings. Nests are often constructed loosely with sticks, stems, leaves and other debris and are built on ledges or cliffs. Pigeons are attracted to cities because of the abundance of ledges and cliff-like nesting sites on buildings. Roosting sites, where pigeons rest or sleep, are often high off the ground, such as exposed roof girders, protected ledges, etc., and are sometimes located near nesting, feeding or loafing areas. 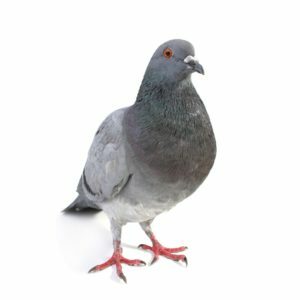 Pigeon droppings are acidic and can damage marble, limestone, painted surfaces, statues, car finishes, etc. More than 50 human diseases and ectoparasites have been associated with pigeons, their nests and droppings. Generally, they represent an unsanitary condition. Color varies from white to black, but is usually bluish gray with two black bands on each wing. 13 inches (33 centimeters) long. About 13 ounces (368 grams). Average adult is 13 inches (33 centimeters) long, weighing about 13 ounces (368 grams). Stocky and robust with a short rounded fan-like tail; color varies from white to black, but is usually bluish gray with two black bands on each wing and reddish feet. Throughout the world, except for the cold northern and less temperate southern areas. Pigeons prefer seeds, grains and some fruit, but will also feed on garbage, animal matter such as insects and spiders, and livestock manure when preferred food is scarce. They prefer flat spaces, like roof tops, for feeding. They also consume grit to help with digestion. Feeding may occur near nesting sites, but often happens away from those areas. Pigeons are monogamous and can have several broods each year. Often eggs are laid before the previous brood has been weaned. Breeding occurs year-round, but peaks in spring and summer. Within eight to 12 days after mating, typically two white eggs are laid in the nest. Eggs need 17-19 days of incubation. Hatchlings (squabs) are almost featherless and are dependent on parents for warmth and food, but quickly become independent, leaving the nest around four to six weeks old. In an urban setting, pigeons can live three to four years. The challenge with pigeon management is an abundance of favorable sites and spillage or food around facilities. An extreme challenge is when people are feeding them.